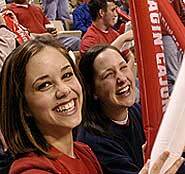 The Summer Music Games is returning to Cajun Field for another year. The 2nd annual Drums Across Cajun Field will be on Wednesday, July 16 at 7 p.m. Ten of the world's most elite marching ensembles will march on Cajun Field for competition. Tickets go on sale May 15 and are available at dci.org or by calling 317-275-1212. Prices are $25/$20/$15 in advance with parties over 20 qualifying for group tickets of $13. Tickets the day of the event will be $28/$23/$18. The show is sponsored by UL Lafayette’s Pride of Acadiana Marching Band with profits going directly to the band. This event will be the first event in Cajun Field to use the new artificial turf surface. This year's participants will be: Blue Stars - LaCrosse, WI, Bluecoats - Canton, OH, Boston Crusaders - Boston, MA, The Cadets - Allentown, PA, Carolina Crown - Ft. Mill, SC, Colts - Dubuque, IA, Crossmen - San Antonio, TX, Glassmen - Toledo, OH, Spirit - Jacksonville, AL, and Teal Sound - Jacksonville, FL.